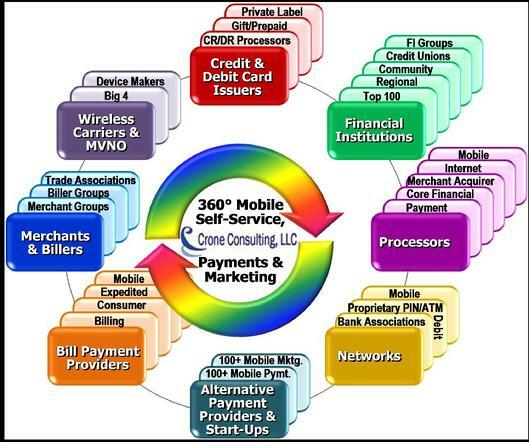 Crone Consulting LLC has developed the Customer Self-Service (CSS) and mobile strategy for many of the biggest players in the ecosystem including all types of financial institutions, core processors, retailers, wireless carriers, handset makers, recurring billers, credit & debit card issuers, networks, and the like. Through our venture capital support we have evaluated more than 100+ startup companies in the space, including performing detailed due diligence on several of the largest merger, acquisition and tier one venture investments in CSS, Electronic Bill Presentment & Payment, expedited and mobile payments. The diagram above illustrates our comprehensive 360° view based on our client base. Check out the Events Page to see current conferences and other activities in mobile payments.